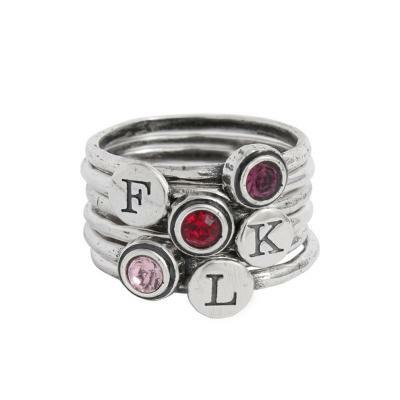 Set of six stackable initial and birthstone rings makes a meaningful gift for the grandmother of three. The initials and birthstones of those you love all stacked together. Stackable initial and birthstones ring set for a grandmother of three. This set comes with three initial rings and three birthstone rings. Stack them up and a wear them to represent your three grandkids. This set makes a wonderful present for a grandmother welcoming her third grandchild.